London - An apology from Oscar Pistorius has been welcomed by the SA Sports Confederation and Olympic Committee (Sascoc), and the governing body is willing to take the sprinter's concerns to the International Paralympic Committee (IPC) if requested to do so. Sascoc CEO Tubby Reddy was speaking in London on Monday following Pistorius’s shock defeat and emotional outburst after a second place finish in the men’s T43-44 200m track final at the Paralympic Games at the weekend. Pistorius raised concerns over the length of the prosthetic blades used by gold medal winner Alan Fonteles Cardoso Oliveira of Brazil and American Blake Leeper who took the bronze. “Oscar made an apology this morning after his emotional outburst and we’ve put out a statement in support of our athlete,” Reddy said. “We understand what transpired and it’s difficult to take a result like that in terms of the emotion. “Having said that, if he has any concerns - and we know he has concerns - we are quite happy as the National Paralympic Committee of South Africa, and as Sascoc, to engage with the IPC and do the necessary in terms of addressing his concerns with them. Reddy had not spoken to Pistorius but he said had lengthy discussions with Team South Africa’s chef de mission, Pieter Badenhorst. “I had a chat with Pieter in the early hours of this morning on the issue and we need to sit with the athlete as we haven’t done that yet,” Reddy said. “The intention is to go back to the Paralympic village after this press conference, engage with the athlete and look at his needs. Pistorius apologised for the timing of the comments he made immediately after Oliveira came from behind in the home straight to beat the South African by 0.07 seconds. "I would never want to detract from another athletes' moment of triumph and I want to apologise for the timing of my comments after yesterday's race," Pistorius said earlier on Monday. "I am happy to work with the IPC who obviously share these aims... I do believe that there is an issue here and I welcome the opportunity to discuss it with the IPC, but I accept that raising these concerns immediately as I stepped off the track was wrong." 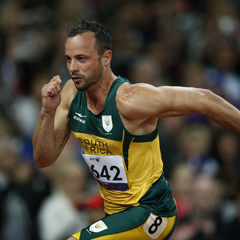 Despite his disappointment, Pistorius still bagged R75 000 for his silver medal on Sunday night. Sascoc promises the country's Paralympic athletes R100 000 per gold medal, with R40 000 for bronze.